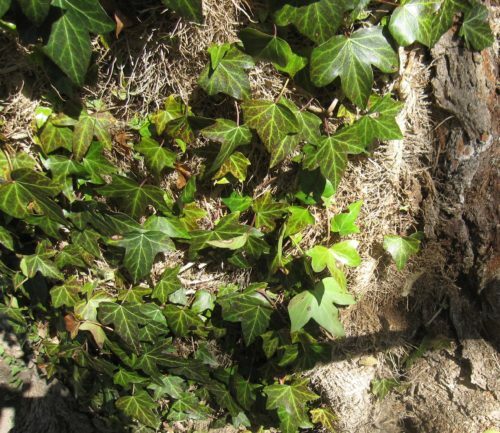 A tree engulfed in English Ivy will exhibit decline for several to many years before it dies. Ivy obscures light for photosynthesis from reaching the tree’s leaves, and the added weight of vines makes younger trees and branches susceptible to blowing over during storms. 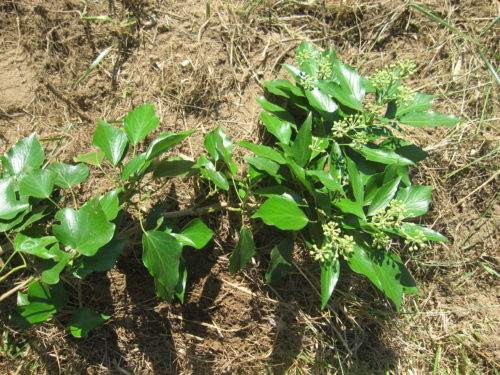 English Ivy also has the ability to spread bacterial leaf scorch, which affects a wide variety of trees, and it creates “ivy deserts” across landscapes. The leaves and dark green (nearly black) berries of English ivy — berries mature at the tree canopy in January — can be toxic to birds, other wildlife, and even humans. Children are especially susceptible to this plant’s poison. Ingestion can cause delirium, stupor, convulsions, hallucinations and fever, and for some, contact with its leaves can cause skin irritation, itching, rash, and blisters. As the vines mature their leaves may be difficult to recognize. Instead of having three lobes, the lobes merge into one leaf. Since poison ivy often grows along with English ivy, wear heavy gloves, glasses (or goggles), sleeves and long pants to cut the vines near the bottom of the tree. Pull and cut all of them at least 2 feet above the ground and pull out, cut and remove from the ground. (Click Vine Removal for details.) Severed vines can be left to air dry. 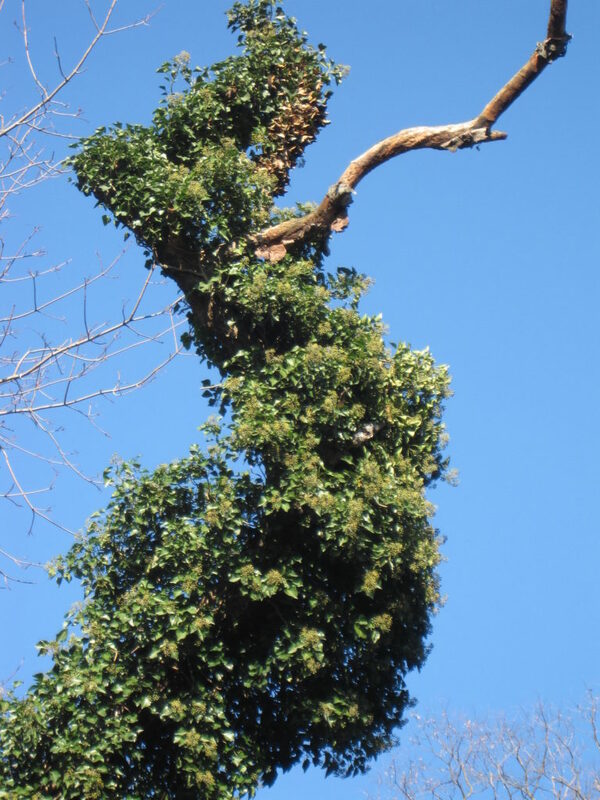 Often embedded in trees, thick vines of mature English ivy (vines exhibit hairs similar to those of poison ivy) can be cut with a limb saw, hammer and chisel, and removed. Specifically, at a foot or two above the ground, cut these large vines in two locations along the vine about five inches apart. 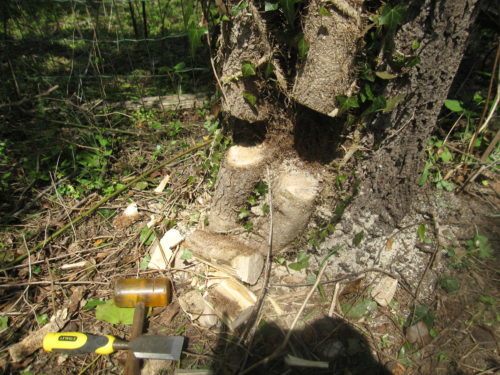 Carefully remove the severed section without damaging the tree. It could take a year for the upper vines to die, when it may be possible to remove the lower portion down to and along or under the ground. Vines tend to wrap around the foot of trees where they girdle them and damage tree roots. To remove patches of ivy running along the ground, start at the outer edge and, using pruners or a pair of 9″ lineman’s pliers, grab, pull and cut each runner for as far as possible. Repeat to where the runner originates at the root. Extract the root, gather the runners, and flip them occasionally to desiccate. This method is quick and effective when the ground is moist and as long as the ivy has never been mowed. Runners cut by mowing establish deep roots at the nodes, resulting in dense overall growth that requires additional root removal. Another option for the English ivy growing along the ground is to smother it by sheet mulching. Lay corrugated cardboard or thick layers of newspaper plus layers of compost, straw and wood chips to kill it. The mulch should stay in place for at least two growing seasons and may need to be augmented several times. Black plastic sheeting secured with landscape staples is another option when laid at least 3 feet from trees, or where tree roots won’t be compromised. Cut runners from around the edge of the plastic.